Remarkable example of New Hampshire Folk Art! 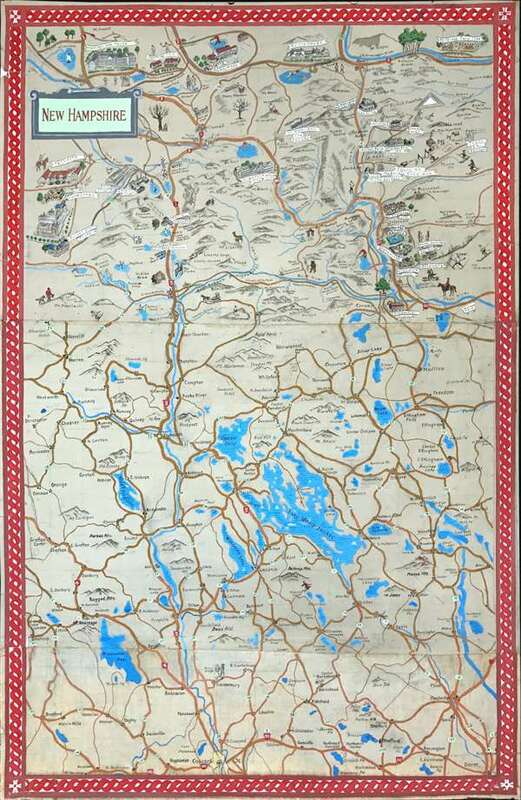 A stunning folk art manuscript pictorial map of central New Hampshire focusing on the historic inns, grand lodges, and sties of the Lake Winnipesauke / White Mountains region. The map is undated but, based upon some of the content, we are able to roughly date it from 1949 to 1956 – the active period of the Thorn Ski School, which appears in the upper right. The map identifies numerous historic inns pictorially including Philbrook Farm, Glen House, Whitney's, the Jackson Falls Christmas Farm Inn, Ravine House, the Waumbek, the supposedly haunted 'Spaulding Inn,' the Crawford Club House, The Mountain View House, The New England Inn, Sunset House, the Homestead, the Millwinds, and more. Mountains and topographical features, including famous trees, are also illustrated. While the coverage of the map extends well south to include Lake Winnipesaukee and Concord, the real focus is the resort life of the White Mountains. The map is unsigned and there is no attribution. Nonetheless, this is a unique piece of New Hampshire folk art. Good. Map has been banked on the back of three painting canvases, which have been stitched together. The original paintings remain visible on verso. Some edge wear / damage, and verso repair to cracks and breaks.